Blowout Sale! Free Shipping Included! 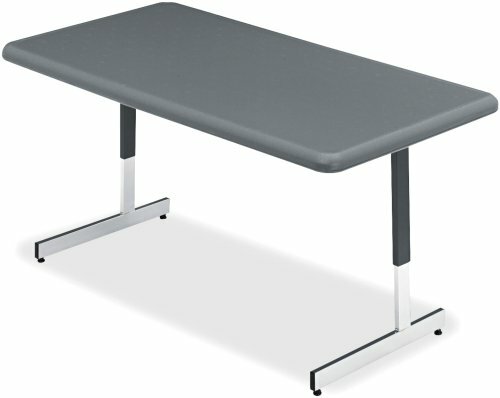 Save 85% on the Iceberg ICE65727 IndestrucTable TOO Adjustable Height Resin Utility Table, 60'' Length x 30'' Width, 21''-31'' Height, Charcoal by Iceberg at The Daily Codex. MPN: ICE65727. Hurry! Limited time offer. Offer valid only while supplies last. Iceberg IndestrucTable Too adjustable height utility table is perfect for tough use environments requiring tables that adjust in height. Iceberg IndestrucTable Too adjustable height utility table is perfect for tough use environments requiring tables that adjust in height. IndestrucTable Too Adjustable Height Utility Tables are constructed of blow molded high density polyethylene and are durable, dent and scratch resistant, and washable. Base is constructed of 1-inches by 2-inches steel tube and is powder coated. Base has non-mar, adjustable leveling glides.